Lee, S. (2013). Flow Cytometric Analysis of Calcium Influx Assay in T cells. Bio-protocol 3(18): e910. DOI: 10.21769/BioProtoc.910. Calcium influx is one of the key signaling events upon stimulation of T cell receptors (TCR) and plays an important role for T cell activation, proliferation, and differentiation. Phorbol myristate acetate (PMA) and calcium ionophore ionomycin are commonly utilized as stimulants in a variety of immunologic assays including T cell activation. PMA is a protein kinase C (PKC) activator, resulting in the activation of Ras, a small GPTase. When PMA and ionomycin are used together, TCR signaling downstream of PKC and Ras can be activated without activation of TCR-triggerd signaling events. 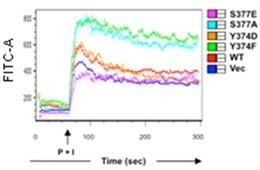 This protocol describes the flow cytometry analysis of intracellular calcium influx in T cells stimulated with PMA and ionomycin. Count cells growing exponentially (1 x 106 per assay). Wash cells once with pre-warmed complete RPMI media at 200 x g for 5 min. Place 1 x 106 cells/250 μl of fresh complete RPMI media into a 5 ml FACS tube. Mix 200 μl of 10x enhancing solution with 1.8 ml of assay buffer. Equilibrate a vial of indicator (stored at -20 °C) at room temperature for 5 min. Add 100 μl of 100% DMSO. Mix well by pipetting up and down multiple times. Store at RT for 10 min to stabilize completely. Store unused indicator in a small aliquot at -20 °C until use. Mix 2 ml of 1x enhancing solution with 2 μl of indicator prepared above. Add 250 μl of 1x loading dye (prepared in step 4) into each tube containing cells. Incubate tube for 1 h in 37 °C CO2 Incubator. Open the FACS DIVA software. Draw a dot plot (Time is on the X-axis, and FITC is on the Y-axis). Place a tube to the FACS machine. Click “Record Data” for 1 min to obtain the basal level of signal. Click “Stop Acquiring” and remove the tube from the FACS machine. Immediately add 1 μl of stimulator [a mixture of PMA (50 ng/ml) and ionomycin (1 μg/ml)]. Vortex briefly and place the tube back to the FACS machine. Click “Record Data” for additional 3 min. Click “Append” to attach acquired signal to the 1 min basal level of signal acquired in step 4. Click “Stop Acquiring” to finish the assay. Analyze each data with FlowJo software by choosing kinetic mode. Overlay sample data on the control data to display the difference of signal between the control and sample on one Figure as shown in Figure 1. Figure 1. Intracellular Ca2+ influx in IKKγ/NEMO-deficient Jurkat T cells stably complemented with Ha-tagged IKKγ/NEMO WT or mutants (S377E, S377A, Y374D, Y374F). Cells were loaded with Ca2+ indicator for 1 h at 37 °C. Intracellular Ca2+ influx upon PMA and ionomycin (P + I) treatment was monitored for 5 min by flow cytometry analysis. Vec stands for vector control. This protocol is adapted from Lee et al. (2012). Lee, S. H., Toth, Z., Wong, L. Y., Brulois, K., Nguyen, J., Lee, J. Y., Zandi, E. and Jung, J. U. (2012). Novel Phosphorylations of IKKγ/NEMO. MBio 3(6): e00411-00412. How to cite: Lee, S. (2013). Flow Cytometric Analysis of Calcium Influx Assay in T cells. Bio-protocol 3(18): e910. DOI: 10.21769/BioProtoc.910.